The 501(c)(3) public charity Ride for Bikes is honored to announce that this year, they will be awarding 600 bikes to the children of southeastern New Mexico. This amount is the most bikes they have done in a single weekend to date. Approximately 300 kindergarteners in the public schools in Artesia will receive a brand-new, 20-inch bike. The year 2018 will mark the first time a bike build will be happening in three locations. Bikes will be built in Artesia, Lovington and Tatum on the same weekend. Ride for Bikes invites everyone to become a part of this community event by assisting in assembling the bikes for the children. They will be assembling and delivering the finished bikes at 7 p.m. Friday, Dec. 7, at Tatum Elementary, 306 W. Third St., and at 8 a.m. Saturday, Dec. 8, at both the Artesia Center, 612 N. Eighth St., and Llano Elementary, 1000 S. First St., in Lovington. To successfully accomplish the Christmas bike goal, the 2018 bike budget is approximately $36,000. Ride for Bikes is asking for your help to meet this objective. This target is set so that no child is left out. Any dollar amount does make a difference and is greatly appreciated. If you are fortunate to be able to generously donate, please do. The cost of one bike is only $60 and brings years of joy to a child. So, ask yourself, how many do I want to buy? To donate to the Ride for Bikes Christmas bike program, send a check made payable to Ride for Bikes GAF to Greater Artesia Foundation, P.O. Box 1344, Artesia, N.M., 88211-1344, or donate online via credit card or PayPal at their secure website, www.rideforbikes.com. Ride for Bikes encourages you to explore the program by viewing the pictures and videos (youtu.be/-0HQAIADhns) of the bike builds and deliveries of years past. You will witness a community of volunteers building bikes and the very grateful expressions of all the children receiving the bikes. The website also has additional information regarding bike building and how to get involved. As always, this event requires many hands and many trailers. 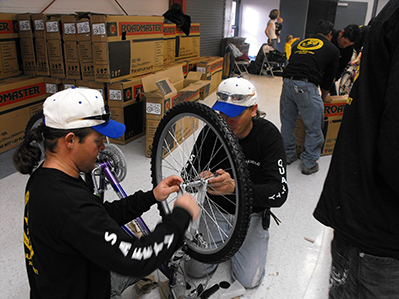 It takes between 100 and 140 people to assemble and deliver bikes at each location. So, they need you to volunteer to help assemble bikes. They are also in need of large, covered horse trailers to transport bikes for the day. Please contact Brandy Shetterly-Kelsey at 575-308-2399 if you have a trailer we can borrow. This community event is a great way for families, companies, churches, or individuals to unite together to make a difference for the children in our communities. Don’t worry if you have not yet put a bike together; there’s a job for everyone. Please contact [email protected] or check out the website, www.rideforbikes.com, for more information. Over the past 12 years, Ride for Bikes has awarded bikes to children in Roswell, Carlsbad, Artesia, Dexter, Lovington and Hagerman. Organizations who have received bikes include CASA, Grammy’s House, Heart’s Desire, Head Start, the Lovington and Artesia public schools, and Big Brothers Big Sisters. More than 4,000 bikes! In those years, Ride for Bikes has had many experiences. Snow blizzards that delayed the delivery truck and threatened to keep bike builders at home, blown out inner tubes, a lost shipment of bikes, and many other potential catastrophes. But through it all, the community stood up and came through. Watching the children run up to get their bikes has always made the program worth it. The Christmas bike program is nicknamed “The Miles of Smiles Project” for good reason. What can you do to help? That is something Ride for Bikes hopes you truly think about. They are very happy with all the participants for what they do for the children in our community. All of this is only possible with your help. Please share this thought with those you think would be interested in donating or volunteering.